In an ideal world I would develop all of my games at a fixed resolution. That resolution just now would be something like 320 x 460. Largely because according to my analytics data from Google the majority of people playing the games do so on an Apple device such as iPhone or iPod Touch. Of course the problem here is that for every 10 Apple players there is going to be at least 1 Android player equipped with an HTC Desire or possibly a Galaxy Tablet or… the list is endless. Fixing the canvas size is also great for knowing where items can initialise on screen. You are able to set an accurate scale to your games, you know just how big the sprites are and just how much freedom of movement they can have. With more fluid dimensions you run in to the territory of working with relative positioning – which is no bad thing and certainly not a difficult thing to work with if you are able to consider it from the outset. 730 different screen resolutions ! So I delve a little deeper to see just what has been viewing these games. So at this point I start to wonder about a few things. What exactly are my options ? Considering each of these options of course introduces other questions. For starters at the point when you grab the window dimensions how has the player got the handset held ? Landscape or Portrait ? For example, if the screen dimensions come back as 640 x 480 is that just because the handset is on its side ? Or is it a desktop resolution. We can of course check window.orientation for this. Generally a value of 0 (zero) indicates a default orientation of portrait. 90 and -90 indicate the alternative orientation of landscape. However, I notice that the Samsung Galaxy Tablet 10.1 sets its default to 0 in a landscape orientation. Very useful indeed. Not. If, in the case of option 4, I decide to continue fixing dimensions do I need to offer multiple sized sprite sets to avoid sprite scaling ? Most probably. Scaling is a performance dog just now and can yield unwanted visual effects. So how do you solve a problem like this ? 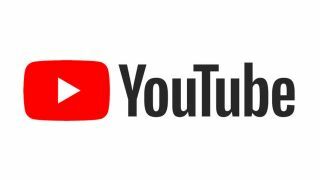 What exactly can you do to give the player a good full screen experience AND ensure that you are catering for all devices ? Does anyone have their own experiences / solutions that they might wish to share ? I ask this question deliberately since I have coded a number of solutions, none that I am truly happy with. Please let me know your thoughts. If comments close (after 7 days to restrict spammers) please mail me. You can find the address in the about page. I will publish your comments if you so wish. Danger Ranger now live. Ditched the idea of a branded game character for now. HyperGunner updated to be more challenging and a little more responsive. HyperGunner now using textdata.js to help localisation. I noticed something interesting earlier whilst trying to improve the performance of Dragons that I thought I should share. When I first considered how the game would look I settled on a full screen scene. I blogged how excited I was about this and that I could finally sit back and create full screen renderings in Photoshop. I’m using .png files for the backdrops. I tend to use that format for everything these days. The theory was simple in that I would run through setLevel() once per level and set everything up. One of the things to set up is the current stage backdrop. For this I set the backgroundImage property of the canvas’ style to be whatever background I choose. Very basic CSS stuff. g is my global namespace. I figured that this would save me a hefty drawImage() call during the main game loop and therefore preserve some frame rate. This was a poor assumption. At least on iOS. And even then it appears more so on iPhone 4. I scratched my head as to why first gen iPod Touch could render the game at roughly 20FPS and iPhone 4 struggled along at around 6FPS. So I played around with it a bit and took stuff out. I also killed shadows on text and cut back on the number of sprites on screen. None of it made a difference. Meanwhile over on Android the game was flying along like a train. I then decided to take a closer look at the “big” stuff. By big stuff I mean the operations that involve the most pixels. I use drawImage for everything so I reduced the size of the sprites and took out sprite scaling and rotation. No real difference was recorded. So I put it all back in. I then took a look at the CSS call to paint the backgroundImage of the canvas in what I thought was a one-time-per-level operation that exists outside of the loop. I stripped out the CSS bit and rendered the full screen scene on every game tick. To try and help it along a bit I also reduced the file size of the .png files from 43k to 3k. I also ignored diffusion since this doubles the file size even at 8bits. 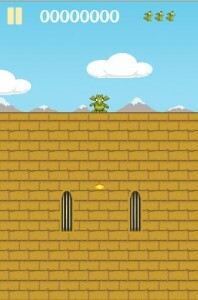 I uploaded the new game code and assets and refreshed Safari on the iPhone4. To my amazement the frame rate had more than doubled to (a still poor but more acceptable) 16-20FPS. Android was, to be frank, no different. It still motored on beautifully. So the valuable lesson that I’ve learned here is that the best course of action on iPhone (at least it is right now before iOS5 arrives) is to do all full screen drawing with drawImage and not rely on CSS. Alternatively of course don’t do ANY full screen drawing. 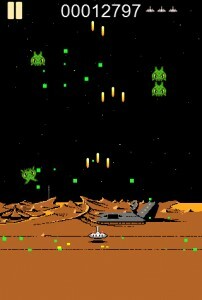 One of the smoother games I’ve completed, Galactians, works against a plain black backdrop a la the arcade games of the early 1980s. Perhaps there’s something in this. I’d love to hear some thoughts on this. I really am not a great coder so muddling through this stuff is often mesmerising at best. Be interesting to hear what other HTML5 game developers are doing to steal back some FPS. I do love these final stages of game development where everything you’ve had scribbled down from ideas to character designs to neat little effects comes together and you get a screen full of activity. I am a huge fan of keeping the screen busy but not too busy. There is a fine line. I’m also loving handing some of my game assets over to static Photoshop created images. It gives me the ability to better match and marry the colour schemes. I have a wealth of sprite / tile art on my machine so it’s always a thrill to sift through some work that is years old to find a cool new starting point. Sometimes the work just fits. Sometimes it needs a little tweak to fit the style that I’m after for the game. I have balanced the attack vs defence vs goals to a decent level – certainly enough to provide a casual challenge. Level times are at around 1 – 1.5 minutes on average. Plenty long enough for a casual game. What I hope to complete before I publish the game is some balance in the scoring system. Just now there isn’t much variety in the scoring and I’m a believer in spreading the scoring based on how much skill / effort was required on the part of the player to actually achieve the score. All in all a good development and a thrill to be working with lots of colour again. I intend to write about the development process in a little more detail soon as well as providing a few pointers on how I create my 2D sprites / tiles. For a long time I’ve wanted to create a game with a fire-breathing Dragon. I’d always imagined it would be a big, hulking monster that would stomp around a scrolling level laying waste to anything that came close to it. The more I thought about the idea the more I struggled to think of anything that would work as a decent challenge. The trouble with hulking great fire-breathing monsters is that they are pretty much invincible. At least that’s where the fun lies. The fact that you can torch anything to the ground ought to be a lot of fun. I guess there are some mechanics that would work in such a game; time limited destruction, for example, but I really didn’t want that. I generally don’t like games where you are pitched against the clock. So I stepped back a little and thought of the game as a shoot ’em up (naturally !). 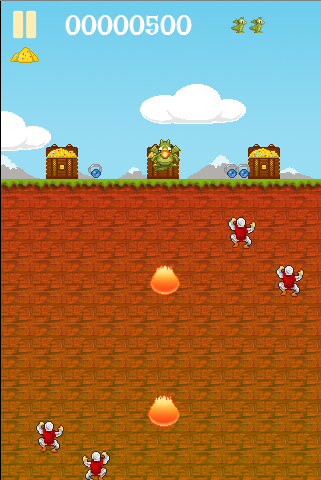 I sketched out some level ideas and realised that for my Dragon I wanted to have the fireballs tumbling down the screen. This I think is more aesthetically pleasing and also serves to reinforce the single finger / thumb control that I aim for in my games. 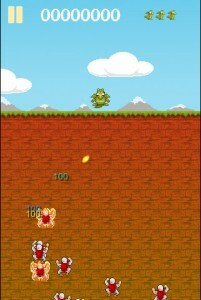 I started off having this floating, fire-breathing Dragon drifting across the screen. I played with it for a while to try and get a feel for what might be a fun thing to do with such a character. Note: I generally don’t think in terms of challenges more in terms of what is fun. For me it is always fun to shoot > kill > explode so I aimed for that first off. Naturally adversaries wouldn’t necessarily explode when hit by a fireball so I adapted the sprite sheet for the knights to include one where they are engulfed in flames. So the game starts to take shape with the Dragon at the top of this ledge protecting “something” that the knights are clearly after. Just to mix it up a bit I also hurl spears and swords at the player to give him something else to think about. 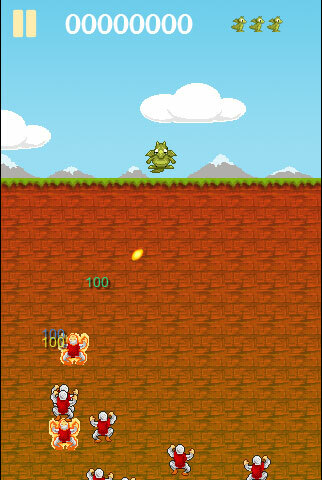 Finally I introduce the overall aim of the game – collect and defend your treasure. I have random treasure items bouncing down from the heavens that the Dragon (player) must collect. 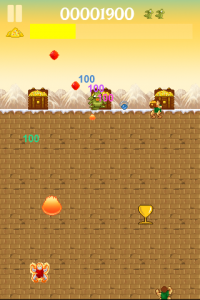 The advancing knights scaling the rockface are intent on stealing from the treasure chests so it is a constant battle to ensure that your treasure levels are high. Once you have enough treasure (indicated by the gold progress bar – not in the current screen shot) you progress to the next stage. Something that I’ve done deliberately in this game is to hand over some of the artwork to a static PNG file that forms the CSS backgroundImage of the game screen. Ordinarily I might have been tempted to draw each treasure chest and the treasure icon separately and then animate them. But this just seemed like another 4 un-necessary drawImage calls. As it is I only ever call the function around a dozen times with each pass. This gives me a fairly acceptable performance across all devices. I hope to have the game finished in the next few days so that I can move on to something new. I still can’t think of a decent title for this game. I guess something will spring to mind. About 10 years ago I worked on a small nGage title called Space Ranger. It was a simple affair of guiding your space hero around a maze with a rocket pack whilst shooting your laser pistol at bizarre cartoon-like aliens and monsters. Great fun and a blast to develop. Luckily, I kept all the art work that I created for the game on disk and recently dug it all out. The rocks (with slight Photoshop filtering going on) and grass ledge in the screenshot are from the Ranger game. Everything else I’ve drawn from scratch. There’s also a snow level with an icy ledge at the top of the rock wall. 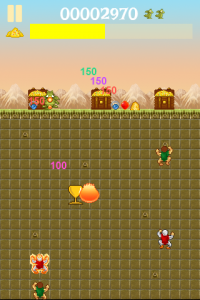 As you can see I’ve coded up the collision with the Dragon’s fireballs (which incidentally right now are the alien bombs from Galactians) so that I can hurl the Knights from the rock face in flames. 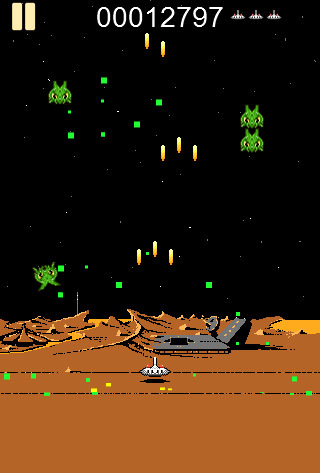 As with the last game I flash up multi-coloured text boxes to indicate the score for hitting each bad guy. The other cool thing is the hovering Dragon sprite. 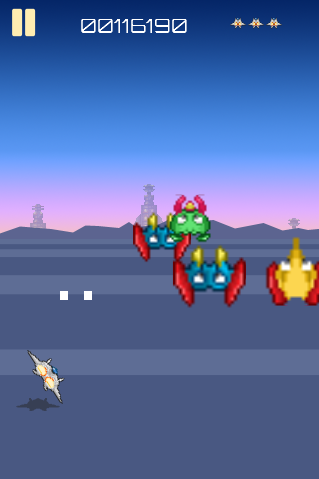 The hovering is done in code but the tiny wing flutterings are done in the artwork. I like the effect a lot and hope to build on the spritesheet to include some other frames for celebratory sequences or the losing of a life / chance. I tend not to deal with design documents. I just like to scribble and sketch ideas and write down what I think would be cool. > Make the Dragon fly rather than shuffle left and right. > Increase the fireball fire rate to be more like a shoot ’em up. > Primary goal of defending treasure. > When all treasure gone Game Over. > Falling monsters / knights in flames collide with other assilants and score combo points. > Change castle setting to a rocky mountain ledge with grass top. > Arrows fired from assailants – vertical only no x shifting. > Need to consider an alternative monster style – not just vertical only movement. I also created a new attacking Knight sprite. 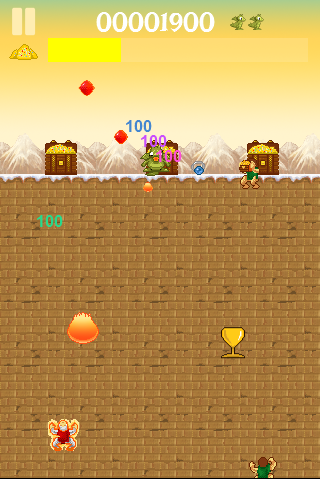 Attacking in the sense that the Knight will scale the wall to steal the Dragon’s treasure. It’s nice to be playing with a fantasy theme for a change. Following on from yesterday’s post about seeking inspiration I took to MAME and played through a number of classic mid-1980s arcade games. A few in there were a lot of fun and yet lacked the colour depth that came a few years later when palettes were increased and screen resolutions improved. I decided to try and knock up a few images for a game that sees the player controlling a baby Dragon atop a castle rampart. The Dragon is defending something (treasure probably) from marauding knights, rogues and critters. His only form of attack is, of course, fire. The player shifts the Dragon horizantally and aims to bump off the attackers who attempt to scale the castle walls below. Creating the sprite sheet for the Dragon was fun. It’s by no means finished but gives me enough to start a game. I created the game’s backdrop as a single 320 x 480 png that is placed in to the canvas background using CSS. No full screen redrawing here ! Anyway, I’m still messing around with the concept but hope to have a game within a couple of weeks.